You are here: Home / Ethnic Groups / The People of Bali and Nusa Tenggara / Who are the Baliaga? The Baliaga are a small people group living in several remote villages on the island of Bali. They are considered to be the original inhabitants of the island and were there long before the 16th century arrival of the people group we now know as Balinese. The culture, language, and religion of the Baliaga differ significantly from that of their Balinese neighbors. Historical evidence shows that there used to be Baliaga villages scattered throughout the island. However, many Baliaga villages have assimilated into the more dominant Balinese culture, especially those located in less remote parts of the island. There is now a movement among the Baliaga to try to preserve their unique culture and maintain their distinctive identity. 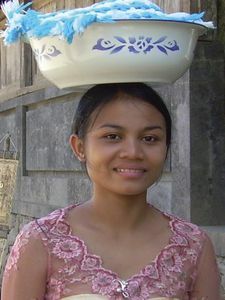 Baliaga people are found primarily in the mountain villages in the Buleleng District area of north-central Bali. They are also found in the Bangli District area and in east Bali in the Karang Asem District area. Although they are small in population, the Baliaga maintain a strong sense of cultural identity and still practice unique rituals found nowhere else. For example, there are many burial rituals among the Baliaga. In the village of Trunyan, the inhabitants do not bury their dead underground, but instead put the bodies in bamboo cages and place them under a massive sacred banyan tree located within the village. The fact that there is no stench from the decaying bodies is attributed to the power of ancestral spirits. In another Baliaga village, the bodies of the dead are cremated in mass cremations of 100 or more corpses. These cremations will often take place long after the person has died. Because of the large number of people being cremated at once, it is not unusual to have thousands of friends and family members attend these events. Another unique aspect of the Baliaga culture is the Banua and Ulu Apad social religious network. Banua are historical geographical areas whose borders usually encompass several Baliaga villages which are clustered around regionally important temples. Traditionally, each Banua is overseen by a council of elders (Ulu Apad), especially in regards to communal decisions and religious ceremonies. It is difficult to distinguish between the culture and the religion of the Baliaga people because these two aspects are so intertwined. Everything about their culture has religious overtones and meaning; from their dances, to their music, even to the way they farm. Although they practice the Balinese form of Hinduism, they are also animistic in their belief system. They are similar to the Balinese in that they worship at family temples, clan temples, and at the Balinese sacred temples such as Besakih and Ulu Danu. However, unlike the Balinese, the Baliaga practice a form of ancestor worship and also incorporate many animistic beliefs into their religion. Because of the relative remoteness of the Baliaga villages, they have not profited as much economically from Bali’s famed tourism. Also, since most of their villages are located high in the mountains instead of near the fertile rice fields, they are limited in the kinds of crops they can grow. Their mountain remoteness and lower economic status causes them to be looked down upon by most Balinese.